The number of boats floating in the background of the picture, along with the landscape in the distance, indicates that this photograph was taken in Cumberland. It almost looks cruel to modern eyes to have small children chained to the deck of a boat but for boating families this was for safety. Accidents involving children, especially falling into the canal, were common and this simple precaution probably saved many children from drowning. 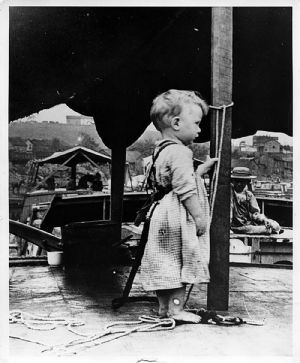 In 1921, 41 families were part of a study of the work of children on the C&O Canal. Of the numerous children within the 41 families studied, 45 children had fallen into the canal at least once.